Can pretending to be in love lead to a real forever ever after happiness? Jayden Sindler is a member of the wedding party for his sister's wedding and has been warned to bring someone with him to keep the single hunting women at arm's length. Luck presents itself in the form of Nash Vargas. 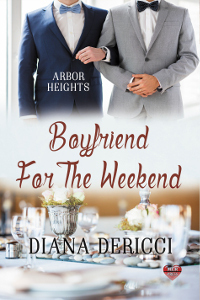 Invited to accompany Jayden, Nash convinces him to playact as something more believable-boyfriends. But what happens when acting turns into real affection? And will there be a future after the weekend?